Striking of arc with electrode is relatively difficult maintenance of a short arc is also difficult except with iron powder electrode. Developing an arc is easier maintenance of short arc is also easier. 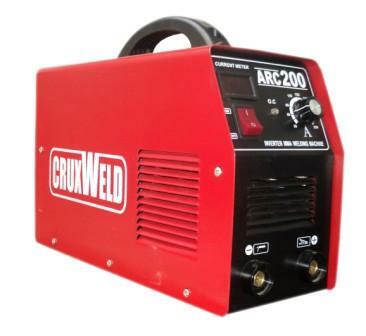 No problem of arc blow in AC arc welding machine. Work piece do not get magnetized in DC. Arc blow is a serve problem and minimised with the use of proper corrective measure. Work piece may get magnetized due to current flow in one direction. No polarity change possible and hence no suitable for welding all metals. It is used for welding ferrous metals. Polarity (DCSP or DCRP) can be changed and hence suitable for welding both ferrous and non-ferrous metal s quality efficient. More suitable for higher current value. It is less suitable for use at low current value with small dia of electrode. It is most suitable with lower current value is also, for example at low amperage with small diameter electrode. Bare electrode cannot be used. Only flux coated electrode with arc stabilizing agent influx can be used. Bare and coated electrode can be used. Not suitable for thin sheets or sheet metal work due to difficulty in striking the arc. It is suitable for welding of sheet metal as striking arc is easier and arc remains steady. Distribution of heat in arc is equal at electrode and job. Most of heat (upto 66.67%) is liberated in the positive side of arc i.e. DC RP. Voltage drop in welding is less and hence welding is suitable for longer distance from welding plant using long welding lead. Voltage drop is relatively higher and hence start cables are used to weld only close to the welding plant. Welding transformer has no moving part and working is salient. A DC generator set has several moving parts therefore operation is noisy. 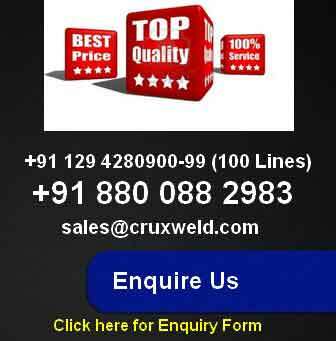 AC transformer welding set is not costly, simpler in operation maintenance cost is also very low. A dc generator set is costly, difficult to operate and very high maintenance cost. All resistance welding operations are automatic and therefore all process variables are pre-set and maintained constant. Once a welding operation has been initiated there is no way in which its progress can be controlled and, thus, the weld cycle is completed as per the pre-set times. 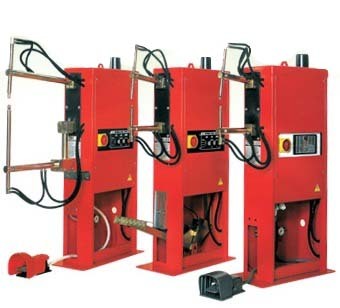 The welding cycle for spot welding machine, seam welding machine and projection welding machine consist basically of four elements viz., squeeze time, weld time, hold time, and off time. These timing are pre-set for a particular metal and a thickness range and the shop operator normally cannot change them on his own. Each one of these four time phases has its own role to play in achieving a sound weld of the required size. The time interval between the application of electrode pressure to the work and switching on the welding currents called the squeeze time. This time interval is provided to assure the contact between the electrode and the work and to initiate the application of force on it. It is the time for which the welding current actually flows to melt the metal at the interface. It is the time for which the electrodes are kept in position, after the welding current is switched off, to assure the application of pressure so as to consolidate the molten metal into a nugget which is then cooled by the dissipation of heat to the surrounding work material. If the applied force is excessive it may result in expulsion of molten metal from in-between the sheets. The time allowed to shift the work to the next location before the cycle is repeated is referred to as the off time. The electrodes are kept off the work during this time interval. Welding current, time of current flow and the electrode pressure are recognized as the fundamental variables of resistance spot welding machine. For achieving quality welds in most metals, these variables are required to be kept within very close limit. The size of the weld nugget and in fact whether it will form or not depends upon the heat being generated faster than it is dissipated by conduction. 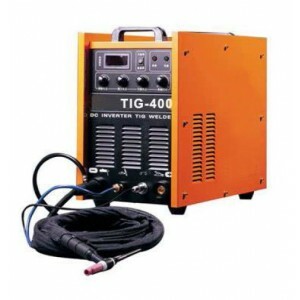 Welding current is, thus , the most critical variable. Both a.c. and d.c. are used to produce spot, seam, and projection welding machine. Most applications use single phase a.c. of mains frequency i.e. 50 hertz. However, d.c. is used for applications that need heavy current and the load for which can be balanced on a 3-phase power line. Also, with direct current machines the rate of current rise and fall can be programmed as per requirements. The current rise period or upslope and current decay period or down slope can be programmed with electronic control systems. Control of upslope helps to avoid overheating and expulsion of molten metal at the beginning of the weld time as the interface resistance at that time is high. Down slope helps to control weld nugget solidification to avoid cracks in weldments particularly in metals that are prone to quench-hardening and hot tearing. 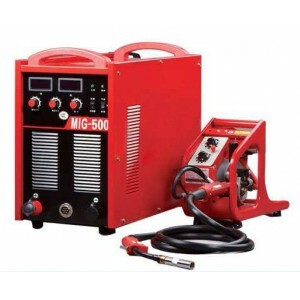 MIG Welding machine is defined as metal inert gas welding. 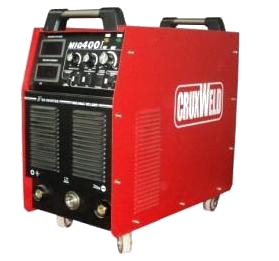 It is also one of the types of arc welding machine. In this process no pressure is applied for welding. In this process of welding wherein coalescence is produced by heat the work piece with an electric arc establish between a continues feed of metal electrode (copper coated) and the work piece. No flux is used as used in submerged arc welding (SAW Welding) but a shielding gas (Ar, He, Co2) is used. It is also known as gas metal arc welding (GMAW). Before welding set the current, wire feed speed and electrical connections. Now arc is struck by one of the two methods. 1st method current and shielding gas flow is switched on and electrode is scratched against the job as usual practice. For striking the arc by 2nd method-electrode is made to touch the job is restricted and moved forward to carry out welding but before striking the arc shielding gas, water and current is switched on during the welding. Torch should be 10 – 12 mm. Away from the work pieces and arc length is kept between 1.5 to 4.0 mm. Arc are basically two types. In self adjusted arc, with decreases in arc length (from L2 to L1) voltage decreases and current increases from l2 to l1 melting the electrode at faster rate resulting into making the arc length normal for self adjusting arc, welding source with flat characteristics is required for self-controlled arc, when arc length decreases, arc voltage also decreases with reduces speed of electric motor and hence the feed rate of electrode this brings arc length to a set value for self-controlled arc, a welding source with dropping characteristics is preferred. VII. Large metal deposition rate are achieved by MIG welding process. IV. All types of material cannot be welded. Arc Welding is a welding process where in coalescence is produced by heating with an electric arc. Mostly arc welding is done by without pressure and with or without use of filler metal depending upon the plate (object) thickness. In arc welding machine arc is formed when an electric current passes between two electrodes separated by a short distance from each other. In arc welding machine one electrode is the welding rod or wire while other is the metal to be welded (work piece), electrode and plate. Arc connected to the supply one of the positive pole and other to negative terminal. Arc is started by moment rally touching the electrode on the plate and the withdrawing it to about 3 to 4 mm from the plate. When the electrode touches the plates, a current flows and as it is withdrawn from the plate the current continues to flow in the form of a spark across the very small gap first formed, this cause the air gap to become ionized or made conducting and as a result the current is able to flow across the gap even when it is very wide, in the form of an electrode must always be touched on to the plate before the arc can be started. Arc is generated be electrons flowing from negative (-ve) to positive (+ve) terminal and electrical energy is changed in the arc into heat and light approximately 2/3 of the heat is generated near the positive (+ve) terminal which burns into the form of a creater. Temperature range from 2700oC-5500oC. While remaining 1/3 is generated near negative (-ve) terminal as electrode connected with positive (+ve) terminal they will burn away 50% faster than if connected to negative (-ve) terminal. Therefore medium coated electrodes and bare electrodes are used.